Ian (M.S. student) and Hannah (undergraduate) explain how to measure arterial stiffness to Houghton High School students. 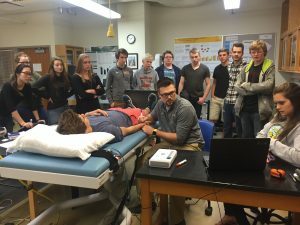 Houghton High School’s Anatomy & Physiology class visited the Department of Biological Sciences and Department of Kinesiology & Integrative Physiology last week. The day began with with Alex Geborkoff (HHS teacher) and his 36 students learning how a Michigan Tech education prepares students to enter a variety of health-related fields from Dr. Shekhar Joshi and Dr. Jason Carter. Afterwards, students attended our Human Pathophysiology course taught by Dr. John Durocher. 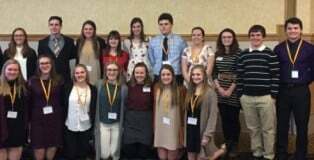 During the class they participated in a case-study related to gastritis and peptic ulcers with current Michigan Tech students. Students also got a taste a college-life by eating lunch at Wadsworth Dining Hall. We are excited to have the opportunity to share our experiences with local students and hope to motivate them to attend college and pursue a career related to health sciences!